PHILIPSBURG – “The dump is my biggest concern. It is a monster. I consider it a giant murderer.” With these famous words, uttered by the minister of public housing, spatial planning, environment and infrastructure, Miklos Giterson, Camiel Koster begun his opening statement in the summary procedure centered around the dump on Thursday. 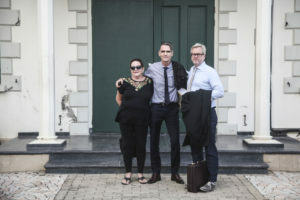 This case takes on the dump, and in doing so the State of Sint Maarten, which is being represented by the State’s lawyer: Aernout Kraaijeveld. Robelto & Son B.V., the company that manages the dump is also being held accountable. Both parties have failed to reduce the nuisance caused by the (burning) dump. Barbara Cannegieter lives less than two kilometers away from the dump, and can tell us a thing or two about the consequences: not only does she have to live with a lot of smoke, and an awful stench, she also has to deal with the health issues that stem from living so close to the dump. Teary eyes, symptoms of asthma, the flu, and headaches. Everyone is worried about the negative effects the dump has on not only their own health but also that of their children, now and in the future. A lot of people agree with her. It wasn’t hard to get statements condemning the dump from people living in its vicinity. Citing a report by World Bank expert Todd Thalhamer, Cannegieter’s lawyers are convinced that the issues surrounding the dump can be resolved within four to five months. No more fire, smoke, fumes, and stench. But how would this be achieved? On May 17th, 2018 after another fire, the minister promised to immediately rescind the contract with Robelto & Son B.V. But now it seems that the contract will not end till the end of 2018. The government also promised to install a ‘waste project manager’ immediately. During the court case the State stated that this would cost 125 million dollars, and would take some time to arrange. Cannegieter and her attorneys are pleading for a concrete plan to re-organize the dump in such a manner to ensure less nuisance and health risks for the inhabitants of the area. If that doesn’t happen, they demand that for every day that the dump is on fire, a sum of 5000 dollars be paid with a maximum of 1 million dollars. These funds could go towards waste prevention such as recycling, and education about separating different types of waste. The judge agrees with Cannegieter and her attorneys. The judge expects to see a concrete plan to stop the fires, and reduce the amount of smoke discharged by the end of next week. And it has to be signed by minister Giterson, who’s currently abroad. The air quality measurements collected around the dump also have to be shared with the public. The judge also demands feedback on a monthly basis regarding the progress made on solving the issues around the dump.